The Mini Peterbilt is something that you have probably not even imagined until now. Even describing it as a mini big rig will not help you much, if you do not see a picture. In essence, it is a functional truck you can drive around … just downsized quite a bit. At Corsia Logistics, we have tons of experience in transporting all kinds of interesting autos, but this one took us by surprise for sure. Seeing something like this definitely leads to a bunch of questions. So, we have figured we can dig a bit deeper into what these mini big rigs are all about. Join us in this walk down “the weird car” alley! What exactly is a mini big rig? It is not your fault if you find it a bit hard to grasp the concept of these vehicles. At first glance, they look a bit like toys. The Mini Peterbilt actually reminds me of those ride-on cars for kids that you see in stores. So is that all it is – a toy truck for adults? Well, not exactly! For starters, these mini big rigs are actually not vehicles per se. They are overhaul kits that you use to make your own Peterbilt. So they need to be built on a functional platform if you want to drive one around. Which begs the questions – can you turn any old car into one of these gems? Sadly, no, but there is a reason for that. The main idea of the mini big rig is to have your own fun automobile as a side project. They are not mass produced, and they are not meant to make your car look funny. Quite a lot of ingenuity, creativity, and engineering have been invested to create a vehicle that can hardly be compared to anything. Except the true big rigs, of course. Now, when you consider how many different car platforms there are on the market, you understand why there cannot be a one-size-fits-all approach for the Mini Peterbilt. Plus, if you really want a functional truck, it has to be built on a truck-like platform, right? And what car really comes close to such a thing? A pickup! Indeed, the mini big rig is just a ’94 to ’98 Ford F250 or F350 in disguise! How does the Mini Peterbilt work then? While the mini big rig is built on a Ford F250 platform, things are not really that simple. We are not talking about just a visual change here. Sure, you can stick some plastic cutouts to a car, paint it all properly and call it a mini big rig, but you will not even be close to what this current thing is. We are talking about a complete body assembly here. That includes everything from the pedals and steering wheel, through the dashboard, to other interesting additions such as functional power windows. This mini big rig kit is not just a cosmetic overhaul – it is essentially a new body for your Ford F250 or F350 skeleton. So much attention to detail has gone into this that even the grille is made completely functional. You are actually expected to rearrange certain parts under the hood of the F250 to make this work. Do not worry though, it is nothing too grandiose. 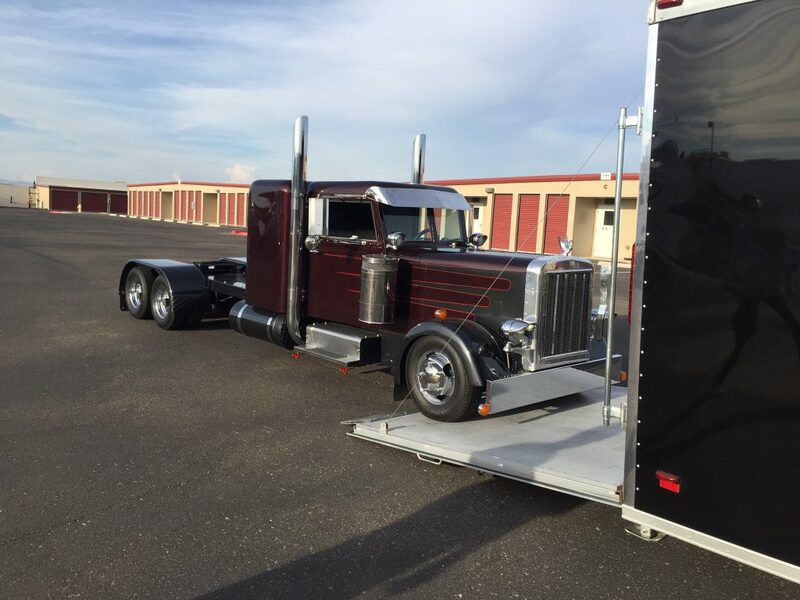 The guys behind the Mini Peterbilt have made installing the kit as easy and straightforward as possible. It even comes mostly pre-assembled to simplify the process. By now you should be convinced that this overhaul is no joke. However, there are a bunch of other additions as well. What if I told you that you can even get the exhaust stacks on the side to be functional? This big rig may be mini, but it starts to look more and more like the real deal with every new thing we learn about it. What other surprises do these mini big rigs hold? If you are a bit like me, you would want to know everything that this mini truck can offer. I have gone through the Mini Peterbilt assembly list to see all the ingenious things they have added to this little big rig. Some of the things are genuinely impressive! Take the sleeper unit for example. Even though a ’95 F250 is not exactly a small pickup, fitting a sleeper unit onto one is a major feat without a doubt. Not only that, but you can also request it with side and rear windows as well. Of course, it will not be as spacious as the real thing, but the attention to detail is just mindboggling. I have already mentioned the exhaust stacks and the fact that they actually work. Now add to that the option of functional fuel tanks and you will see why this creation is not a Ford F250/F350 anymore! The icing on the cake comes with other details, such as steel air intakes, a visor, proper side mirrors, adequate wipers, and even a working A/C. Who is the mini big rig for? There is one thing for certain – the Mini Peterbilt is definitely unique. When we were asked to take care of its auto transport we could not even categorize it at first. Do you ship it like a truck or do you take it as a pickup? It is surely bigger than the latter, but then again not really truck-sized. It just breaks the definitions! Of course, this did not stop us – we organized its shipping without a problem. And yet the issue of how you would classify this vehicle still stands. Because if you cannot give it a proper definition, you cannot really figure out its exact purpose either. It is not a hauler like the true big rig, and it is no longer an F250 country workhorse. See, being fascinated by the Mini Peterbilt is one thing, but getting one for yourself? That is a completely different story! I know this would make for a fun side project, especially if you are into DIY things. But at the same time, it is hard to imagine many people lining up to drive a mini big rig around town. Perhaps this is where the secret lies. These kinds of overhaul kits are not for everybody. I bet that if you are the right person to get one, you already know it. Whether you want to use it as an attraction or to just have the fun vehicle in town, go for it. And if you get one, but do not want to drive it across the States when you move, call us. After all, we have already shipped a Mini Peterbilt – we know how it is done!